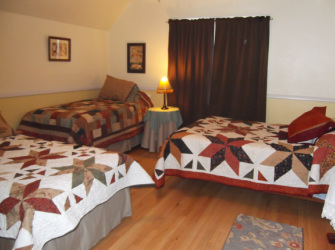 A spacious bedroom on the main level with 3 twins and one king size bed, with handmade quilts and lots of closet space and original wood floors. The full bathroom on the main level is just down the hall. You'll find plenty of private outdoor living space in the picket fence enclosed backyard. A perfect spot for morning coffee, or an evening meal. 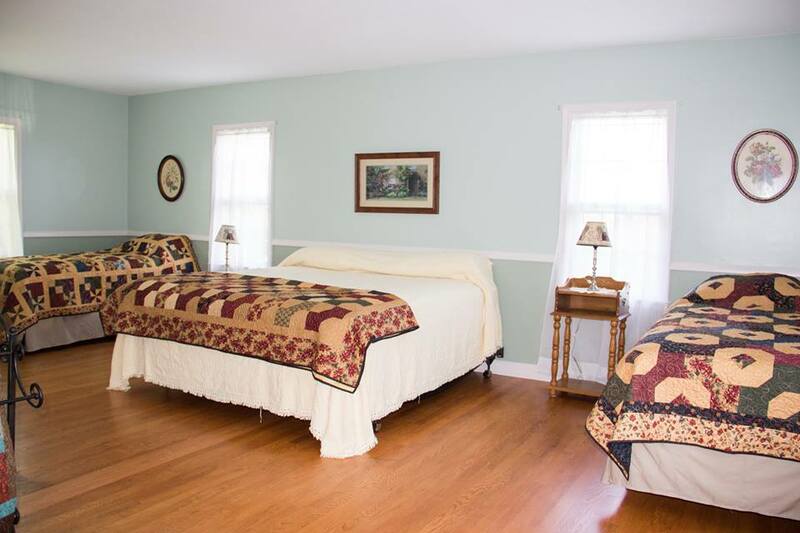 This upstairs bedroom offers two twin beds and a full size bed, all with handmade quilts, a large closet, built in dressers and wood floors. The full bathroom is just down the hall. There is another full bath on the second floor as well. 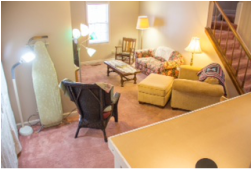 The open staircase leads to 2 bedrooms and a full bath. Full size eat-in kitchen, with dishwasher, stove, microwave and refrigerator. Our fully stocked kitchen includes coffee maker, toaster, hand mixer, blender, slow cooker, new pots and pans and dishes. the cupboards are stocked for all types of cooking and baking. If you are in need of anything special please let us know. Here is our super sized cutting table that will allow at least 3 people to be working at the same time, complete with side lights, one large cutting mat and storage underneath. You will also find 2 design walls, 2 ironing boards and irons, this area is off the den.